It's small scale and took a little while to put together but it's great! Add elegance and high fashion to your dining experience with this iron and crystal three-light chandelier. This candelabra-style crystal chandelier has vintage charm and a flair of dramatic sophistication that sets the perfect mood for your next meal. 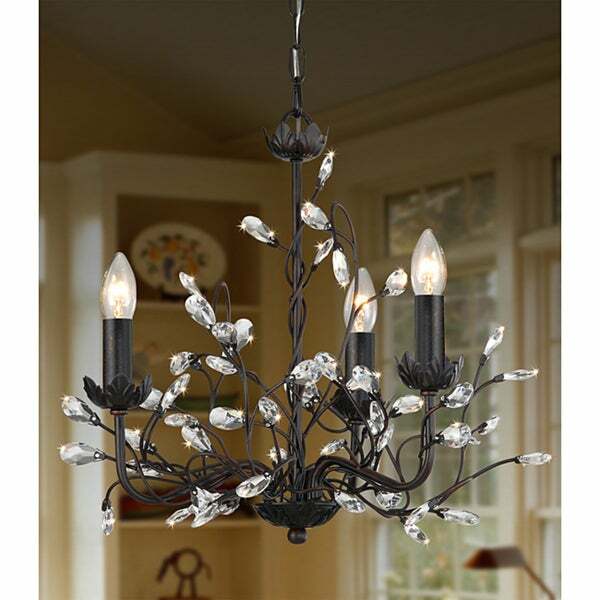 Black vine-like stems are set off by shimmering crystal accents to enhance the beauty of your home. I assembled this chandelier and it require an hour of time to unwrap and affix all the crystals. If you are hanging this from a high ceiling, you may not have enough chain/wire! This chandelier looks dynamite in my kitchen. I was worried it would be too much for my white cabinet/black island kitchen but it is more funky and less formal that a traditional chandelier. Even the guys like it. I had it installed almost flush to the ceiling with maybe an inch of chain and it still looks great. Installation of the crystals is a pain but it took about 2 hours while watching TV so all in all, not that bad. Needle nose pliers are a must! Definitely get it. love this fixture. it is hanging in the powder room and gives a real unexpected touch of elegance. the fixture is a perfect size for the powder room. would love to have a huge version for the dining room or entry hall. just know that the crystals take about an hour to attach to the fixture. its easy to do, but detailed work. I installed the crystals before I gave to the electrician to hang, so I wouldn not have to pay him to do it. it takes a tiny screw driver, good eysight and a littel patience. but WELL worth it. This looks like a million bucks. I purchased this chandelier for a nursery and could not be more delighted with it! It arrived quickly and was well packaged. The chandelier has beautiful lines and the iron appears to be good quality. Once hung and with dimmers the chandelier crystals catch the light and there is a nice casting of light on the ceiling. I look at this chandelier many times and this was one of my favorite purchases of all time. I would still have purchased it again even if it was 3x the cost... Only thing I would mention would be to pay careful attention to dimensions since it is not huge. This is a very pretty chandelier. It is perfect for my small formal dining room (10 x 11.) The crystals weren't very difficult to attach. It was a little time consuming as others have mentioned. It took me about an hour or so to complete by myself. I do recommend having needle nose pliers on hand. I had to bend some of the metal openings to accommodate the base of the crystals. I also recommend placing the chandelier on the cardboard ring that is part of the packaging. It will keep the chandelier elevated so you can attach the lower crystals and will also allow you to keep it suspended upright until it's time to hang. I hired an electrician, so I cannot comment on the difficulty or ease of hanging. The crystals are glass. I had 9 additional crystals left over as well as several pins, so know that extras are included. This chandelier is honestly very beautiful. It was very easy to assemble and has held up well for three years now. It does cast vine shaped shadows on the wall at night, so if you don't like the look of that you may want a different chandelier. We hung this in our foyer and have received compliments each time someone new comes over. 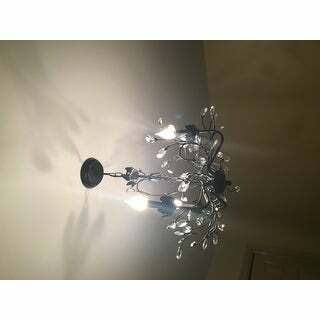 I ordered this chandelier for my 10x11' dining area. The amount of light is surpurb for the size of the space. The crystals combined with the iron creates a delicate and eye-catching feature. I am thrilled with the quality of this item. As others mentioned, it is timeconsuming to attach all the crystals. It took me approximately 1 1/2 hours with wire cutters and needle nose pliers, but was worth every minute. I am so pleased with the quality of this chandelier. Some reviewers stated they did not have installation instructions, my box did - clear diagram easy to follow. The glass crystals appear to be 2nds (some blemishes noticeable up close, not upon installation). Attaching crystals process equal to any crystal accented chandelier; first crystal I picked up was broken, then I dropped one! No problem the manufacturer had included plenty of spares. I loose fitted all crystals, then went back cutting off excess pin material & tightening all pins. Pins appear to be aluminum nails which should oxidize over time & just disappear. Comparative silhouette to Horchow's upside-down leaf chandelier at 4 times the price. Bought 2 of these - one for my front entry way and one for the 2nd floor landing directly above it. My whole family is in love with these lights. These are really, really pretty. They are sparkly and modern, but yet casual and "cool" at the same time. I measured and re-measured and was a little nervous about it hanging too low in the entry but it worked out great. The shortest we could go was using one link which (in our home) allows a 6'3" person to walk underneath. Taller friends - go around. It did take a little while to get all the crystals on, but there were tons of extra pins and a few extra crystals also. Just a hint- the crystals attach to 4-pronged stems. 2 face each other with a tiny hole, the other two are on the sides of the crystal. Take a pair of needlenose pliers and just SLIGHTLY bend each prong (especially the sides) out at a 45 degree angle. It will make getting the crystal in there and threading the pin through it easier. I wasn't sure what to do with the end of the pin after getting it though the prong, crystal and other prong, so I just bent it around the base of the crystal. Then, take your pliers and gently squeeze each pair of prongs back together to hold the crystal sticking out. Otherwise, it will "sag" to the side. It sounds bad but really once I got the hang of it, I did both fixtures in about an hour. Turn on a good tv show and get busy. It's worth it!!! It's truly a beautiful piece at a GREAT price. Give yourself several hours and a glass of wine to put the crystals on the chandelier. T-E-D-I-O-US!!! You will need a pair of needle nose pliers. The finished product is STUNNING. I put shades on the bulbs to cut down on the glare. Great product for the price. LOVE this Chandelier! Very Classy!! I am so sad I will have to return this item. It is absolutely beautiful, but way too small to put in the living room as a center light. Probably would be good over a table or in a small space. This item's photo is beautiful. I bought it, knowing from prior reviews it required assemly. What I did not know is that it has no assembly instructions, AND the crystals (61) are intended to be attached to the flat black metal frame, with bright silver pins about 1-1/4" long, by inserting the pins through the metal/crystal/metal, and then wrapping the silver pin around and around. I confirmed this through the manufacturer, who also confirmed I could not just glue the crystals in place. It would have looked like something I assembled in the garage. It's a shame, because the picture is beautiful, just NOT what it would have looked like in my dining room. Love this chandelier, it's pretty, but the wrought iron makes a more organic look vs a super girly chandelier. The pins used to attach the glass are now a color you don't have to spray paint as previous reviewers had recommended. Yay!!! Was easy to put together, my husband and I had to both be involved to hang it, but it was relatively painless for the result. Worth it. I have a very open floor plan (kitchen, dining & living area) This light is perfect above my round dining table. Just enough! Very nice quality for the price but the crystals are kind of a pain to attach and clean. Had this for 7 years and still love it. Bought 3 others like it for our rental homes. I love this little chandelier. I hung it as lighting for my walk-in closet and it just made the area elegant and fun. It is of good quality and I would recommend it to anyone. I love the way this light sparkles at night. It’s very similar to one from PB. I hung it in my foyer and have received many compliments on how pretty it looks. I would definitely purchase this light again! This is a beautiful light fixture. Couldn’t be more pleased! Love this light. I have purchased it a few times in different sizes for a few homes. We have moved three times in just a few years and the buyers always ask for this light to stay with house. It gives off beautiful light through the crystals. The only bad part is that you have to place all the crystals on yourself. It is easy but time consuming...worth the effort. This chandelier was the perfect addition to my stairwell from the first to 2nd floor. It hangs in front of a large outside window and makes an attractive presentation. It was time consuming to attach the crystals but once done was worth the effort. "I have seen this light in a foyer and the owner had a lager version in open dining room, can I get the larger?" "Can extra chain be purchased?" Went to the local lowes and got a swag extension kit. Came in black, easy to spray paint brown. "Looking for more of an antique bronze. Does the brown color come close?" Hello LSchwerdt, we appreciate your inquiry. Yes, this item comes very close to a dark antique bronze. Thank you for shopping with us! "Can this fixture be installed on a pitched / slanted ceiling?" Hello idahomac, yes, this chandelier can be installed on a pitched ceiling. Thank you for shopping with us! "Is this chandelier Black? There are several colors in the description so I'm not sure which color it is. Thank You!" Hello fabidancer, yes, this chandelier is black. Sorry for the confusion. Thank you for shopping with us! Hoping it is as nice as it looks online. "Hi, does this light come in larger sizes and can you ship to Australia please? 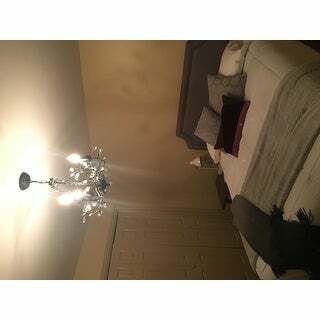 Thank you"
I bought this chandelier from overstock and can't say enough about it! I love it! However, since this company can't ship to you, I would suggest going to Pottery Barn. They have something very similar in both a small and large size. I think the light style is called the Camilla Chandelier. Good luck.